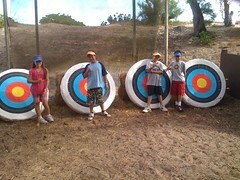 Went to Camp Erdman in Mokule’ia with the 4th graders last Thursday – Friday. Still recovering…. I’ll be returning to camp this Wednesday – Friday with the 7th graders. Please pray for me…. Nah. Actually, it’s a lot of fun. It’s a great way to bond with the teachers and students. Camp Erdman is a pretty special place for people who grow up here in Hawai’i.